I’ve had these Shortcake blocks half-way finished since March and decided that I should get a move on it and sew them up. This dark, fall-ish fabrics gives the pattern such a different look than my last Shortcake quilt…it sure makes the white pop. This fabric is called Oh My! by Sanae for Moda. It came out awhile ago…but I still found jelly rolls here, here, and yardage here also. This particular quilt is a throw size and made with a jelly roll. Beautiful quilt! I love the contrast of the rich bold colors and the white!! 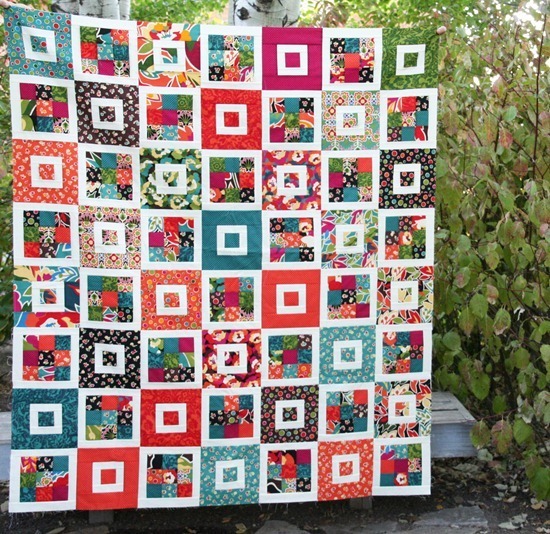 I love how the block on the top right blends into the background :) Such a cute quilt! Bright and Cheery. I like. What a wonderful quilt! 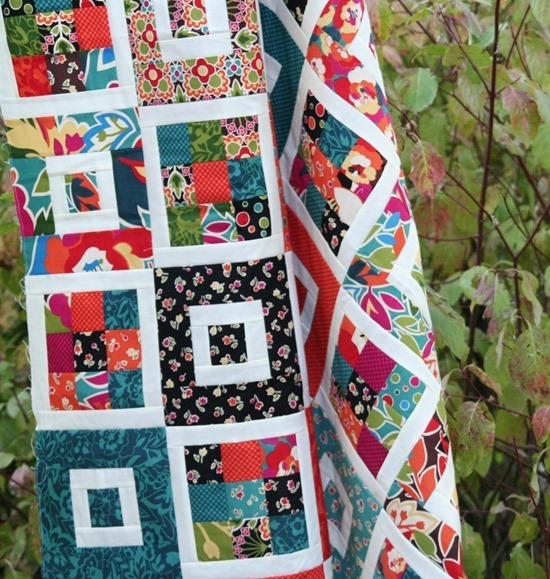 And isn't it amazing how different quilts can look like, even if the same fabrics are used…? Love those darker colours. Beautiful. I hope you are having a great beginning to your new week. My deepest congrats on your special little one!! Just gorgeous! I love how colorful it is! It's such a nice alternative to the really girly quilts out there – it's very grown up. The white also makes it look a bit 3D I think. If I'd made this I'd be very pleased with myself! Beautiful quilt!!! Love this rich palette. This is one of my favorites!! LOVE LOVE LOVE The colors and the pattern!! Beautiful quilt. I love the colors. Love this idea! great way to work with extra pieces. great job. What perfect, non-holiday colors for the season! So pretty! This is just one jelly roll? Plus the white? I love this design! Bright, cheery, colorful, love it, well done! Love the quilt. My favorite quilts always have a pop of white. I love your quilt! Bright quilts are my favorite and the white does set it off. I am really excited about winning the ruler!! I can't wait to get it and use it!! Thanks so much!! I think I'm in love with this one! I love the colors against the white! Congratulations… will you change your blogname to Cluck Cluck Cluck Sew :)! Congratulations on your sweet #3! I love this quilt, the white is the perfect accent to pop all those colors. My favorite part, though, is how the upper right hand corner does the Spock mind-meld with the background foliage! Just saw your announcement, so congratulations! We just started trying for #3 this month, so I hope to be joining you soon. :) It's scary and exciting at the same time! Love the pattern here, although the colors are a bit bright for me. Thanks for sharing. I love seeing the things you make. They are very inspiring to me! I love the color scheme of this fabric line, especially the raspberry. 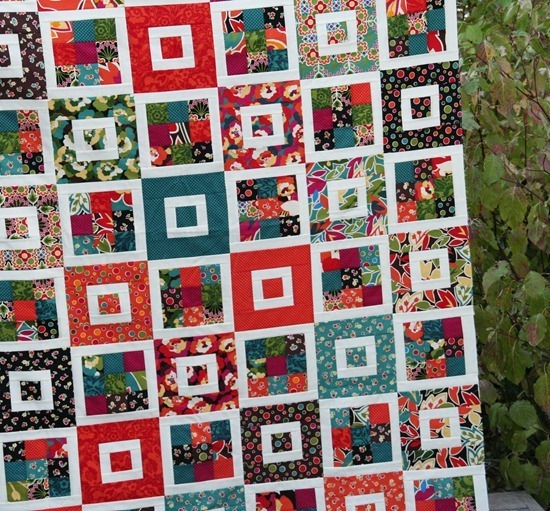 Wouldn't have guesses it goes so well with with a white but your quilt turned out stunning. I got teased that I should only give my husband a tie for Father's day instead of making babies ;) I truely believe that babies come at the right time– even if we seem not so ready. Hope you are feeling well. I love the effect of the white contrast throughout. I just read your earlier post where you said you forgot the name of the fabric in your shortcakes quilt: It's "Oh My!" by Sanae: I love it AND your quilt!! !